"After a devastating war between humanity and Faerie, Liza's world has forever changed. Plants and trees became aggressive, seeking to root in living flesh and bone, and newborn children were discovered to have magical powers. Liza was one of these children, and with her abilities she brought her mother back from the ruined Faerie realm and restored the seasons to her own. Now there are signs of a new sickness in the forest. Piles of ash are found where living creatures once stood. Liza investigates and discovers that the Faerie realm has continued to deteriorate, slowly turning to dust, and that its fate is inexorably lined to that of the human realm. To find a solution, Liza must risk crossing over, putting herself and all she cares about at risk. Will Liza be forced to sacrifice her life and the lives of her friends in order to save both worlds?" Sigh. I really tried to like this trilogy. Believe me. I did. After the first book, I decided to give the author another chance with Faerie Winter (not on this site for a review), and that disappointed me. Faerie After held the last string of hope I had for this great idea that Simner had going. Sadly, the whole trilogy did not live up to my expectations. 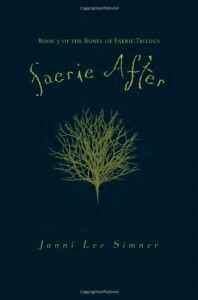 As for the plot, Faerie After followed the same plot in the same format from the other two books. Something happens in the World, and Liza, Matthew, and Allie have to travel through the woods to find whatever will help stop the evil going on. After some time, it gets boring having to read about the same adventures that are just told in a different way. I found it hard to imagine Faerie and the World (like the forests, towns, etc) as well. There was some description, but I was left confused about the whole scenery and how everything looked. As for the description of the War itself and how it started, Faerie After did a relatively better job at shedding light on the subject than the other two books did, and I really appreciated that. All in all, the Bones of Faerie trilogy had an amazing starting idea with the post-apocalyptic aspect and the War between the two worlds. Unfortunately, the execution and the world building did not do the idea justice. However, I did like the uniqueness and the creativity that Simner brought to the table, but I feel that if she spent a little more time sorting out the information she wanted to include, this trilogy would have received a better rating.